The jury that will decide the fate of Benjamin Vargas was given its instructions for deliberation Thursday afternoon. Not included in what the 12-member panel could consider: first degree murder. That’s because Judge George Eskin said that, based on the evidence, no rational trier of fact could find Vargas guilty of first degree murder, which requires premeditation and deliberation. 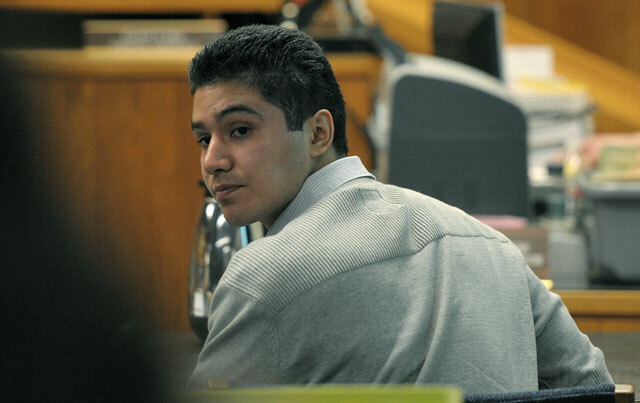 The defendant is accused of stabbing to death Vincent Velasquez during an altercation in Isla Vista in May 2011. The judge’s decision meant the jury was only instructed on the elements of second degree murder as well as voluntary manslaughter. It also meant the jury heard instructions about the defenses to those charges. While a second degree murder conviction would require that Vargas acted with “malice aforethought,” if the jury finds Vargas “acted upon a sudden quarrel” or “acted under the direct and immediate influence of provocation,” the charge could be reduced to voluntary manslaughter. As well, if Vargas acted in “imperfect self-defense,” second degree murder could be dropped to manslaughter. If the jury finds he used “perfect self-defense,” the homicide was justifiable and he could not be found guilty of a crime. To be justifiable, the jury must find that Vargas believed retaliation was necessary to avert imminent death or great bodily harm. He also must not have been the initial aggressor. Defense attorney Ron Bamieh made the motion after prosecutor Hans Almgren concluded his case, asking the judge to eliminate the first degree murder instruction, and the judge made his ruling Wednesday morning. While Bamieh is conceding his client stabbed Velasquez, he said Vargas acted out of self-defense. According to testimony, the two started fighting on Abrego Road in Isla Vista, with Velasquez throwing the first punch. The two began grappling, with Velasquez gaining the upper hand, according to testimony. But things changed at some point, with Velasquez eventually dropping to a knee. A friend saw that he was bloody and rushed him to the hospital, where he died. Though no witnesses ever saw a knife, it was later discovered that Velasquez had died from 16 stab wounds. While he no longer will have to get the jury to believe his client acted willfully and deliberately in stabbing Velasquez (elements for first degree murder), Bamieh may have a hard time convincing the jury that the 16 stab wounds Velasquez received during the brawl were justified. Closing arguments will take place Thursday.